What Do You Carry When Walking in Golf? 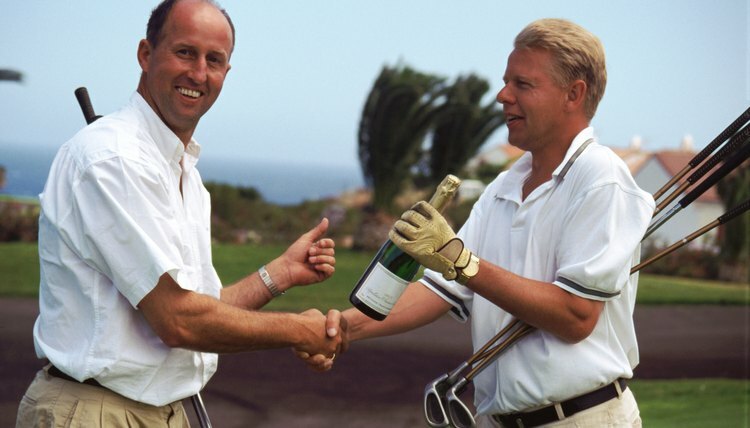 It's a good idea to drink while you play golf, but you may want to stick with water. Even if you’re playing on an empty course, an 18-hole round of golf will likely take at least three hours, and probably at least four if you’re walking, as opposed to riding in a golf cart. Nine holes of golf won’t require as much preparation, but if you’re playing 18 without a cart there are a few items you should always carry in your golf bag. Water is your obvious No. 1 need when you’re walking the course. Water is available on most courses, but it’s still a good idea to carry a drink of your own to be certain you stay hydrated. If in doubt, just carry water, although a variety of bottled sports drinks are available. Some PGA Tour pros carry electrolyte pills that they take with water for extra protection against dehydration. If you’re playing a 7,000-yard course you’ll walk about 4 miles during your round. Add in 70, 80 or 90 swings and you’re expending plenty of energy, so it’s a good idea to at least have a light snack during your round. Bill Haas says many of his fellow PGA Tour players bring peanut butter-and-jelly sandwiches, although he prefers packages of dried berries and nuts. Yani Tseng carries chocolate-covered almonds, but if it’s hot you’ll need to eat those early in the round so they don’t melt. Jim Furyk eats energy bars, while some pros go for bananas. Golfers should apply sunscreen before playing, but it’s a good idea to reinforce your protection during a long day in the sun, particularly if you’re playing around noon during the summer. PGA Tour pro Ricky Barnes says he carries sunscreen because “sun exposure is probably the biggest thing in our sport that I'm not a fan of.” To deal with sweaty hands, Ian Poulter carries talcum powder in his bag. Unless you’re certain about the weather you may want to bring protective gear, such as an umbrella or an extra jacket. A bottle of eye drops is a must if you have allergies. Although touring pro Fredrik Jacobson doesn’t have allergies, he carries a bottle of eye drops just in case something gets in his eyes. Some pro golfers, such as Alvaro Quiros, carry medical tape to prevent or deal with blisters.